This week’s minorities in cartoons entry is Tasmanian Devil (real name Hugh Dawkins), a DC Comics superhero and member of the team the Global Guardians. Hugh first appeared in “Super Friends” #7 (October 1977). Writer E. Nelson Bridwell and artist Ramona Fradon created Hugh. Dawkins’ backstory doesn’t give the origin of his powers (besides being born with them). However, he has the ability to transform at will into a human-sized Tasmanian devil (in a similar fashion to a werewolf), with super-strength and razor-sharp claws/fangs. As such, Dawkins decided to use his abilities to fight crime and function as a superhero in his native Australia. Dawkins did joke once about the origin of his powers (as a mash-up of various cliched superhero origins). Despite his more aggressive manner while transformed, as Dawkins he’s generally a pacifist and friendly. Tasmanian Devil also tends to use various Australian colloquialisms. 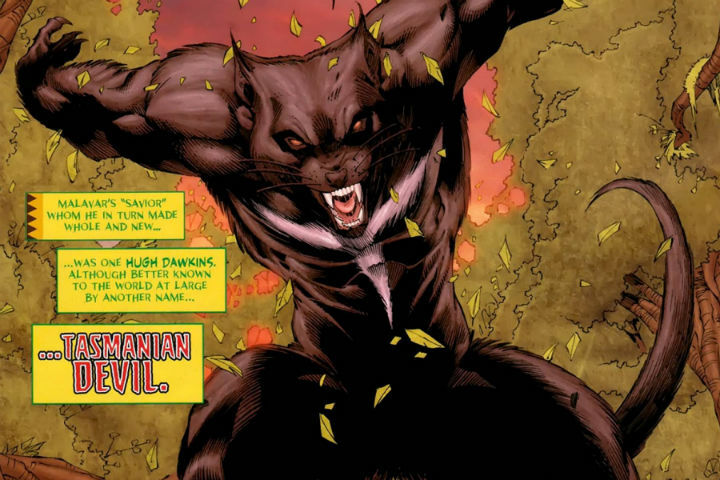 Eventually, Dawkins was contacted by Dr. Mist to join the worldwide superhero group the Global Guardians, with which Tasmanian Devil served as a long-time member. Tasmanian Devil made his DCU-proper first appearance in November 1986’s “Infinity, Inc.” #32. Dawkins would later also serve for a time as a member of Justice League Europe. Hugh was revealed to be gay in “Justice League Quarterly” #8 (September 1992). Later stories showed Hugh dating the Mikaal Tomas Starman. A low point (for Tasmanian Devil, treatment of gay characters in Big Two comics, and superhero comics in general) was the 2009 miniseries “Justice League: Cry For Justice.” There, Tasmanian Devil was killed, skinned, and turned into a rug by the villain Prometheus. Fortunately, this was undone in a 2011 storyline, and Dawkins was brought back to life. Finally, if you’re wondering, Tasmanian Devil has no relation to the more famous Tasmanian Devil of “Looney Tunes” fame. However, media conglomerate Time Warner is the owner of both characters. Why is Tasmanian Devil a minority? Is it because he is Australian, Gay, or is a person of color? I’m not sure from reading the profile and I can’t tell his race from the picture. Devil’s a gay man, and thus falls under “minority.” See also my other entries on LGBT characters.